Halo: Fall of Reach - Invasion (formerly Halo: Fall of Reach - Pillar of Autumn) is the third and final story arc in Halo: Fall of Reach, a comic-book adaptation of the first Halo novel, Halo: The Fall of Reach published by Marvel Comics. The series follows the general plot of the novel with a number of alterations in details. For a full list of the differences, see list of changes in Halo: Fall of Reach. Consisting of four issues, Invasion chronicles the Fall of Reach and the events leading up to Halo: Combat Evolved. The first issue begins following the weeks after the Battle of Sigma Octanus IV. Captain Keyes is debriefed at Camp Hathcock about the intercepted Covenant transmission and is assigned command of the UNSC Pillar of Autumn. John receives upgrades to his Neural interface and is introduced to the MJOLNIR Mark V armor and the suit's AI companion, Cortana. Together, they partake in a field test to ring a bell by going through an obstacle course involving Orbital Drop Shock Troopers, a minefield with Lotus anti-tank mines, automated chain guns, and an unexpected SkyHawk. Meanwhile, out on the edge of the Epsilon Eridani system, Remote Scanning Outpost Fermion receives data from one of its returning Slipstream space probes indicating that a fleet of Covenant ships have arrived in system. Unable to erase vital information, the Fermion self-destructs in accordance with Cole Protocol. 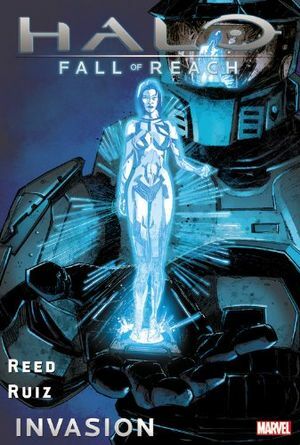 The second issue follows John and Cortana as they successfully pass Colonel Ackerson's field test. As an act of revenge for having tried to kill her and John, Cortana has Ackerson transferred to the front lines. All focus is then switched to Operation: RED FLAG, a secret mission that involves the Spartan-IIs seizing a Covenant vessel in hopes of capturing a Covenant Hierarch. However, the mission is interrupted when the Covenant fleet begins attacking Reach. The Covenant land troops on Reach with the objective of destroying the generators for the Super MACs. At the same time, Cortana reveals that the UNSC prowler Circumference, is still docked in Reach Station Gamma and has not initiated the Cole Protocol. John takes Linda-058 and James-005 to deal with the Circumference, while the rest of the Spartans led by Fred-104 are sent down to the planet to defend the MACs' power generators. The third issue begins with Fred and the rest of Red Team heading down to the surface of Reach to assist in defending Orbital Defense Generator Facility A-331. During the descent, their Pelican is damaged and forced to crash-land near the generator station. Meanwhile, John's team arrive at Gamma station. As the Battle of Reach continues in orbit, many UNSC ships including the Musashi and the Herodotus are destroyed by a massive Covenant warship. Under Keyes' command the Pillar of Autumn uses its MAC and over 500 Archer missiles to drop the ship's shields and obliterate it. Back on Gamma station, James is lost in the vacuum of space after being struck by a plasma bolt just as they blow an entrance inside the facility. The issue ends with John and Linda going to destroy the Circumference's NAV data and finding the station overrun with Covenant troops. The fourth and final issue opens with Sergeant Johnson and his Marines fighting Kig-Yar rangers onboard Gamma station. They are soon assisted by John and Linda and move together toward the Circumference. Meanwhile on Reach, Red Team loses contact with the Pillar of Autumn and continue to defend the station. As an incoming wave of Covenant approach the facility, Fred and his team stand defiant. Back at Gamma station, John finds and destroys the Circumference's navigation system. Everyone is then evacuated by Pelican back to the Autumn but Linda is impaled from behind by an Elite wielding an energy sword. Once inside the Autumn, Linda is placed in a cryotube in the hope that she can be later resuscitated. The Autumn is forced to flee Reach, jumping to a random location. However, Cortana secretly inserts coordinates translated from symbols on the artifact that Blue Team discovered during the battle of Sigma Octanus IV. The story arc ends with the Autumn exiting slipspace weeks later and arriving at Installation 04.